Success! Grace from Kenya raised $640 to fund thyroid surgery. Grace's treatment was fully funded on April 12, 2017. Grace had a successful surgery in our medical partner’s facility. The risk of further increase in the size of the goiter was reduced. She will no longer experience difficulty breathing or swallowing. Grace is a 27-year-old woman from Burundi who is currently living in Kenya as a refugee. She works as a French translator, and she and her husband operate a motorcycle transportation business. They have two children together. Grace began having breathing difficulties in December of 2013. She has since been diagnosed with a goiter, a thyroid enlargement. This causes her pain and makes breathing and swallowing difficult. Grace is scheduled to undergo a thyroidectomy on January 27. This procedure will alleviate her symptoms, allowing her to breathe easily. 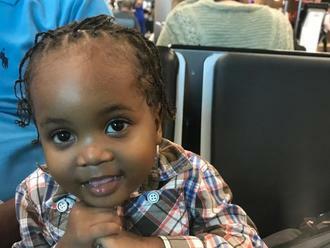 Our medical partner, African Mission Healthcare Foundation, is requesting $640 to pay for the surgery. Grace's case was submitted by Joan Kadagaya at African Mission Healthcare Foundation in Kenya. Grace was submitted by Joan Kadagaya, Curative Medical Support Program-Partner Representative at African Mission Healthcare Foundation, our medical partner in Kenya. Grace's profile was published to start raising funds. Grace received treatment at AIC Kijabe Hospital. Medical partners often provide care to patients accepted by Watsi before those patients are fully funded, operating under the guarantee that the cost of care will be paid for by donors. Grace's treatment was successful. Read the update. Grace's treatment was fully funded. The thyroid gland is an organ located in the front of your neck. It releases hormones that control your metabolism (the way your body uses energy), breathing, heart rate, nervous system, weight, body temperature, and many other functions. When the thyroid gland is overactive (hyperthyroidism) the body’s processes speed up and you may experience nervousness, anxiety, rapid heartbeat, hand tremor, excessive sweating, weight loss, and sleep problems, among other symptoms. In case of thyroid cancer, the surgery is the patient’s best chance of preventing the spread of cancer and saving the patient’s life. In cases of hyperthyroidism, the treatment help stabilize the hormones that regulate metabolism and effectively treat some of the patient's symptoms, such as rapid heartbeat, anxiety etc. The accessibility of the treatment is fairly easy in this region. Due to the high numbers of patients flocking to the government facilities, most patients opt to seek care in missionary and private hospitals which are slightly more costly. In Kijabe, we have an average of 80 to 100 thyroidectomies in a year (three to four cases a week).